, for being too old! Moe, Larry, and Curly try to help the old woman by creating a medicine that will make her young again — âand after a comical scene of the Stooges mixing up their potion (“the mortar, the merrier!” – I love their mixing it in an old rubber boot, as well) — and incredibly enough, it works! The young Christine throws away her cane and shawl, and tears off the bottom several inches of her dress – only to have the wolves in the Stooges come out and howl. Shemp Howard: Ow, why did you hit me with the pestle? 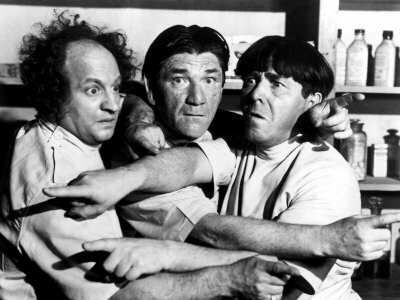 Moe Howard: Your lucky I didn’t hit you with the mortar. Larry Fine: Ha Ha Ha! The mortar the merrier! Larry Fine: [at the table eating marshmallow cake, which was inadvertently made with bubble gum, instead ] What do you call this cake? Mrs. Cerina Flint (Christine McIntyre): Marshmallow Jumbo. Larry Fine: [whispering to Moe] Tastes more like Marshmallow Gumbo.